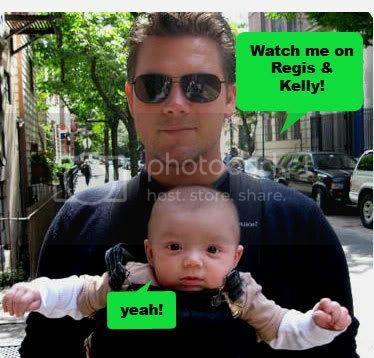 Tyler Florence will appear on Regis & Kelly tomorrow (Wed., January 30) for its "Healthy Hearty Football Party." "Healthy" doesn't really fit into the ULTIMATE equation that Tyler's known for, but let's see what he can do. P.S. - that kid is cute! Gee I read this post too late to set my Tivo to catch this monumentus segment on Regis& Kelly. What did ole Tyler make for them ? Did he use the word Beautiful a million times to describe a chicken wing. Hang on a minute. A segment on this show is what 10 minutes? So he was only able to use the word beautiful 40 times then ? but someone needs to tell him to use some other adjectives. So many Lugan FN hosts are following the same manual when taping shows. This past season of Tylers Ultimate, he used the word beautiful 40,675 times. Switch it up dude. I just want to thank you because you've been the main reason why my grandmother is not depresses right now, you know, she's recovering from a surgery and has to stay on bed... so you can imagine how frustrating it must be to be on your bed without doing a thing.